When TooFatLardies first came out with Dux Britanniarum I fell in love with the game and started putting together forces for it. I managed to get a good deal for a load of Romano British troops which I swapped for a copy of Games Workshop’s Space Hulk, which had been sitting on a shelf for a couple of years. 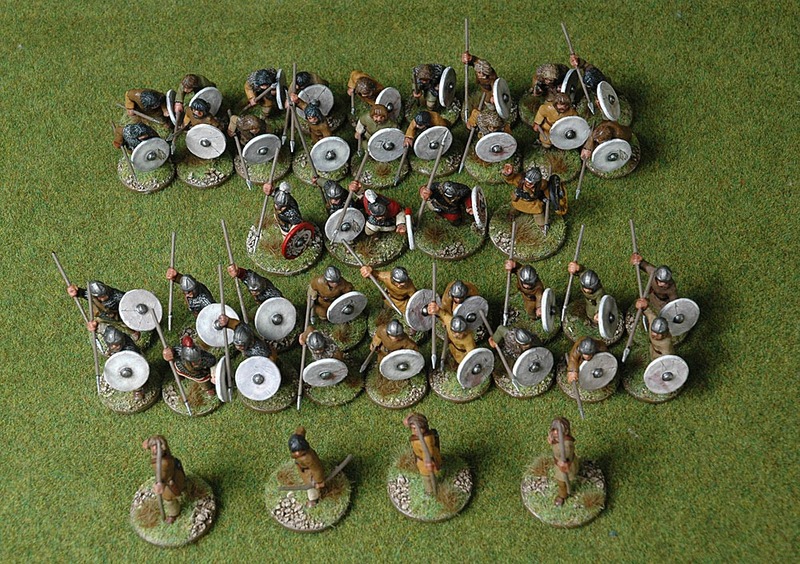 I’ve got enough of these Romano-British to do just about any force I’ll ever need in the game, all the reinforcement units from the campaign and a few spare men for the men who turn up when you do well in a battle. But I’ve never really liked them that much, they’re just a bit too Roman for me and I’ve always wanted something a bit more British, something more “hairy arsed” if you like. When I heard that the Lardies were going to release the Raiders supplement I volunteered for play-testing and I bought a force of Picts from my mate Jack Glanville. We used these with one of his his British forces (he’s got two, one very Roman and one much more British) to playtest the rules and to put on a display game at Crisis in Antwerp. 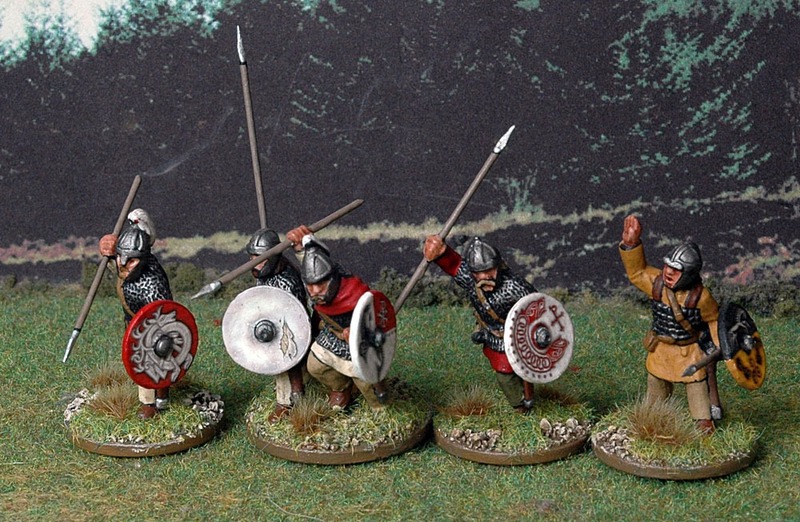 I also painted up a starter force of Scots, and messed about a bit to make my Romano-British a bit more native, but to my mind they still don’t look right for the Gw&#375;r y Gogledd , the Men of the North who fought the Picts, the Scots and the Angles throughout the period covered by the rules. So I wanted a force to represent them, I live in what were the heartlands of Gododdin after all, about 5 miles from the presumed site of their capital, Din Eidyn, on what is now called Castle Rock in Edinburgh. Having spent a while planning them this is what I’ve got. 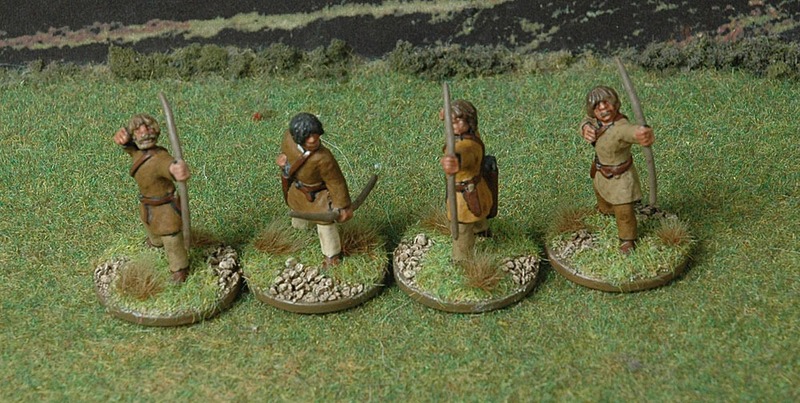 I decided that the look of most Arthurian troops sold by figures companies are all too Romanised for the look I wanted so I went with Musketeer Miniatures Goths. 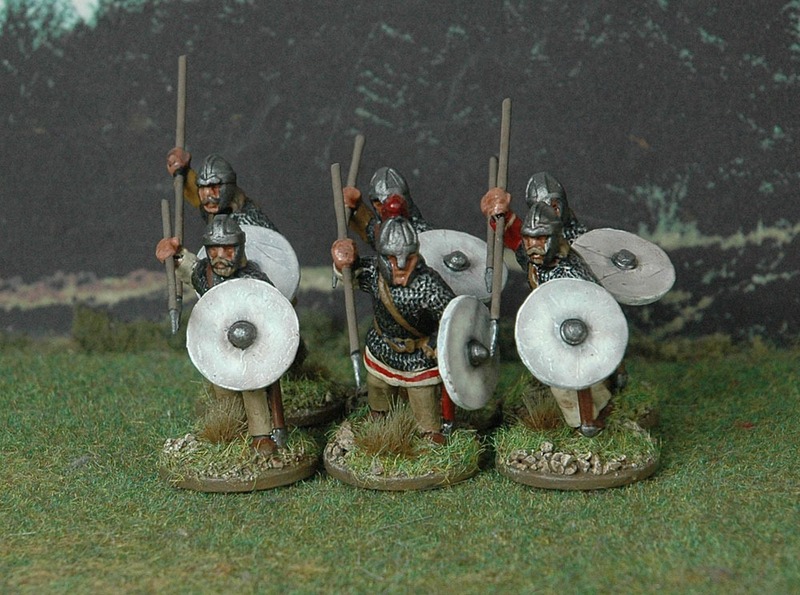 They’re a lot more hairy than most models that are sold as Arthurian British, beards and long hair abound, and they’ve all got trousers, while traditionally British are portrayed with bare legs. That suits me fine, I wanted hairy and it’s cold here in East Lothian and anyone exposed to the idea of trousers (as the Men of the North were during the relatively short period of Roman occupation) would realise that they were an excellent idea. Some of them are wearing fur waistcoats and a few of the armoured types have mail hanging from the back of their helmets. I can easily live with what might might be seen as inaccuracies, given that the overall look of the force is what I want. The Goths also fit in very well with the rather lovely Arthurian Knights from Musketeer. I’ve now finished a starting force for the Gw&#375;r y Gogledd in Raiders, but just the infantry, I haven’t yet started on the cavalry options, that’s the next job on my painting To-Do list. Here are the leaders of the force, the Lord is based on a 300mm circle along with his standard bearer, the Champion is waving his spear in the air and there are two other Nobles, a well armoured one who will command the Elites and the Warriors, and a less well armoured on who will be in command of the Levy. They all have fancy painted shields as befits their status, the normal troops all have plain white shields. (DAG08 Goth Infantry Command except the figure on the left who is from DAG11 Armoured Infantry). The elite Teulu, heavily armoured with a bad attitude (DAG11 Armoured Infantry). The Lord is obviously rich, he’s got enough money to equip his Combrogi warriors with helmets (DAG10 Unarmoured Infantry in Helmets). But the Pagneses, the levy troops in the force, just have shields (DAG09 Unarmoured Infantry). While nobody really cares about the archers (DAG12 Infantry Archers). I have painted the force with a rather restricted palette, especially the lower class warriors and levy. The colours I have used are based on the results of a natural dye workshop my wife went on a few years ago in which she spent a day trying out all sorts of dying techniques using plants occurring naturally in this part of the world and came home with a load of hanks of wool in a variety of shades of brown, most of them yellowish brown. I spent ages thinking about what to do with the shields and spent much time searching for information on the internet. In the end I came to the conclusion that there’s actually very little that can be said about British shield patterns in this period and that much of the conventional wisdom is based on really rather flimsy evidence. Most wargames just seem to want to make life easy for themselves and just go with the commercially available transfers that enable you to turn out decent looking troops quickly. That approach suits me fine, I lack the painting skill to do anything that approaches the look I get using my favourite transfers from Little Big Men Studios. I’m contemplating making some transfers of my own, small crosses, Chi-Rhos, alphas and omegas and using them to add detail to the shields of some of the troops, mainly the Teulu, but this can wait until I’ve finished painting the cavalry. I’ll post about them just as soon as they’re finished. One thing is missing and that’s a standard. I’m not at all sure what I want and haven’t yet thought of anything I really like. I’ve looked through all the commercially available ones, but nothings caught my eye, and looked at people armies on the internet with similar lack of success. Any good ideas anyone? Great looking army! Really good idea to give them all ‘white’ shields. Of course when you start on the cavalry you’ll have to re- do the Lord and champion as mounted figures but DAG 001 and DAG 002 have the ones you need. That’s a long term plan. But at first I’m just going to use a single level 2 Noble to go with the cavalry. If you use the Lord he can never command anything else and the cavalry have nobody to command them if he dies. If you use the lower level Noble all you you lose is a few attacks in melee. But your Lord can command the infantry and also rally the cavalry if necessary. i think it’s more flexible that way.